Experience the gift of a LifeSmile. Carefully designed and structured to compliment your facial features, which results in natural looking teeth. If you’re not familiar with porcelain veneers or have never heard of the procedure, then it’s reassuring to know that it’s a fast and straightforward process that requires absolutely no downtime and is virtually painless. Also, the fact that Dr. Mitchmore has done hundreds of veneers ensures that you are in the right hands and the process is smooth sailing. Porcelain veneers are a thin layer of porcelain in the shape of a wafer-like tooth. They’re as thin as your fingernails but are very durable; strong and just as hard as enamel. Veneers will last many years and are designed to resist stains as well as withstand chipping. Creating the right shade of porcelain veneers is very important, especially if all your teeth don’t require them. In addition to color, there also has to be consistency with the proportionate size of each tooth and shape. Good quality porcelain veneers require careful hands and an eye for natural design, which are qualities Dr. Randy Mitchmore displays. Click play to learn more about porcelain veneers. From the very beginning, each step of the way was spelled out and followed with a personal professionalism that let me know each team member was concerned for my comfort and understanding of the process. Each and every team member became a trusted family member and beloved friend. Learn more about this innovative cosmetic dental treatment. Improve your confidence and self-esteem – instantly! Unfortunately, not all Houston dentists have the same training, skills, talent, level of care, or judgment. That is why you cannot comparison shop veneers based on cost alone. Dr. Mitchmore is honored to be one of the few dentists in the country to be named a Master of The Academy of General Dentistry. This allows him to provide superior care when fitting your new porcelain veneers. Having an attractive, bright, and healthy smile is a dream come true for most individuals. Let Dr. Randy Mitchmore make your dream a reality and give you a fabulous smile with porcelain veneers. 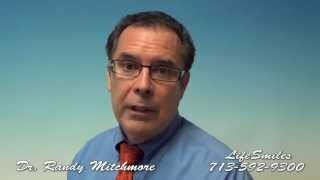 Accept your gift of a LifeSmile with Dr. Mitchmore. Step 1: We prepare the teeth by shaving a tiny layer off each tooth, measuring anywhere from .3 to .5 millimeters, to make room for the veneers so that you don’t end up with bulky looking teeth. Your Houston cosmetic dentist then makes an impression of your teeth using the advanced 3-D camera! No more gooey, gaggy smelly impressions to run down your throat! The digital scan is sent to the laboratory via the internet at light speed. Your porcelain veneers are then created by highly trained technicians that have trained with Dr. Mitchmore in our partner dental lab. Step 2: Once the porcelain veneers have been made, another appointment is set up for you to try them on. During this time, your dentist will make sure that the fit, shape, and size are perfect and to your liking. We do this by using a temporary paste to hold the veneers on your tooth before permanently bonding them into position. This would be the perfect time to bring up any reservations or concerns you may have so that these can be addressed before the porcelain veneers go on permanently. Once your dentist has gotten your approval on the veneers, the bonding will commence. Dr. Mitchmore uses the latest and most advanced materials and technology when it comes to bonding porcelain veneers. He uses the least invasive technique possible called minimal to no-prep veneers. Many times this procedure can be completed with no anesthesia at all. We have no doubt that you will love your new smile! Immaculate attention to detail and precise techniques during every treatment.